A naive team (or boss) will want to start their agile process by researching, purchasing, and installing all sorts of automated, web-based tools. This is odd when you consider that a major value of Agile is to prefer human interactions over tools and processes. Agile begins with people. Do strive to automate build, test, and install processes. You don't really want to press a button on a web page to get the tests to run. You want the testing built into your IDE or watching your source directories for changes. The dream is to always "just know" if you've broken anything, and to make releases a non-event. That's hard to do when your processes require manual intervention. Automate early and often. Automate dull, tedious, or repetitive work because it makes your day seem long. Prefer to acquire rather than build, because the fun work of automating the dull work has a siren's song. Get it working, make it invisible, and get on with the work. Don't fear shell scripts, IDE automation scripts, or the like. But don't be fascinated with them either; automation by individuals (or pairs) still has to pay off in increased productivity for the whole team. Automate to free time for creative, intellectual work. Automating is not something you do to seem more professional, to impress your peers, or to earn some kind of "automation points" with superiors. The point is to not have to spend time doing trivial and boring work. Rather than getting good at switching between multiple files and cut-n-pasting code, one should eliminate the wasted motion through design or automation. Then one can take on more interesting, difficult work and complete it within an interation boundary. Never automate evolving processes. If you standardize a process that isn't settled in, you will either freeze the process prematurely, or you will be playing catch-up as the process continues to change. Alternatively, if you must automate an evolving process, be prepared to evolve your automation regularly or discard it and take over manually. Do not automate in order to avoid human interaction. Building "avoidance technology" is contrary to the first principles of the agile manifesto. It is never our goal to avoid interaction with the Customer or between the QA and Programmers. Instead, add consider what techniques (low-tech or otherwise) will draw all the participants closer together or leave it alone. Prefer physical artifacts with coercive immediacy over virtual artifacts stored somewhere in software. A corkboard loaded with 3x5 index cards will have more influence on a team's actions than a set of virtual cards in a web server somewhere. Manual processses with physical items have been a mainstay of agile development. Low-tech, high-touch processes can be quite satisfying. Software serves the team, never the reverse. Nobody comes to work just to feed the machines. When the automation software demands tedious and/or meaningless efforts from the team, is it worth keeping? 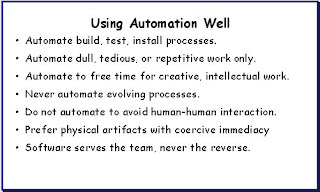 Automation is supposed to make it possible for us to do more interesting work, it is not supposed to increase tedium. When software gets in the way, the next retrospective action should be obvious. All developers owe a debt to those who build great tools like Eclipse, Vim, Emacs, etc. Great tools tend to have a wonderful transparency. In a good editor, the code seems to almost dance and shape itself before your eyes. Great build tools like Paster and Maven take a lot of the effort out of building deployable modules. These things are wonderful. On the other hand, someone has to turn out the business applications during the day job, and for those hours of the day it is important that the application is the star of the day and the tools melt into the background.